Synopsis: As Little Blue Truck makes his way through the countryside, he exchanges greetings with all the animals whom he encounters and meets a big Dump Truck who hasn’t got “time to pass the day with every duck along the way.” When the Dump Truck gets stuck in mud, Little Blue Truck and his animal friends come to the rescue and Dump Truck learns the value of friendship. The book rhymes well and the illustrations are adorable. Bilingual benefit: The book beautifully introduces English onomatopoeia as each animal greets Little Blue Truck with his own animal sound. Sheep baa, cows moo, toads croak, and horses neigh. In addition, Little Blue Truck beeps and Dump Truck honks. 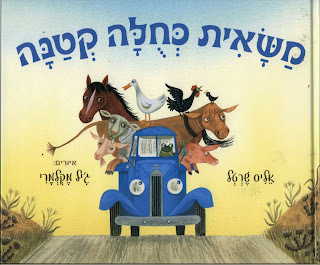 The book is also available in Hebrew. Availability in Israel: I have not come across the English version in Israel but the book can be ordered online via Amazon. The Hebrew version is available in Israel. I also found the English-language sequel, entitled “Little Blue Truck Leads the Way,” in a branch of Tzomet Sfarim in Tel Aviv. Previewing the book: This book is available for preview on Amazon USA. (last checked 2/10/2014). Lil guy: Trucks. Mud. Animal Sounds. Awesome.